I am Adele de Caso and I am currently living in Spain with my family: my husband Jaime and my children Sofia 15, Phoebe 12 and Javier 7. We have lived here on and off for the past 10 years, but are currently enjoying one of our longer stints. Jaime is half Spanish, and the reason we decided we wanted to spend time in Spain was that we wanted our children to grow up bilingual. Jaime never had the opportunity to learn when he was a child. As we first spent time in Spain when our girls were very small, they both are now fluent in Spanish (I wish I could say the same for us…) and our little boy is part way there. Becoming fed up with my job in a hospital laboratory following graduation from university, led me to becoming involved in a network marketing company. Both me and my husband ran this business part time alongside our jobs until our income from the business was sufficient for us both to leave work. This was fantastic as it meant more quality time with our children. As well as the income and the flexibility of the business, one of the major benefits to me was the self development that I gained. The business introduced me to books, audios and also trainings that helped me to grow as a person and gain confidence, as growing up I had always been very shy. The flexibility of the business has made it possible for us to move between Spain and the UK. When we first moved to Spain I decided to pursue something that I had always dreamed of, which was to write a book. Our children were at school from 9 until 5 every day so I used some of this time to get started on my first book: Shy People Can Be Successful Too! which was published in 2009. 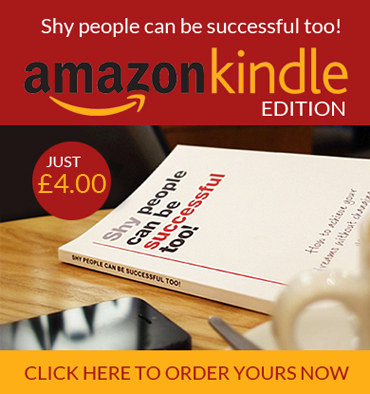 It is a compilation of everything I learnt that helped me to deal with my shyness. I learnt to embrace it instead of seeing it as a flaw. I have now written my second book 52 Tips For A Fantastic Year! – Simple Ideas Big Impact. I really enjoy helping people to achieve success in their lives, especially people who don’t feel that they have the confidence to do it. If I can do it, anyone can. I love the fact that I can run both of my businesses from Spain. I talk to people on the phone about the network marketing business and help them get started, and I help people through my website, blog, books and newsletters on the personal development side of becoming successful. I sell my books through my online shop which also stocks framed quotes and plaques, another one of my passions. Running a business here also means that I have to be really organised because the children finish school at 2pm so nothing can really get done after this time at least not until the evening. I do use the time when they are doing their activities to sit and get things done: I will either read personal development books, part write blog posts or call some people in these small pockets of time. It is something I have always done, used the ‘nooks and crannies’ of the day. Almost every morning after dropping off at school, Jaime and I go for a brisk walk along the promenade with our dog and then stop somewhere for breakfast. Starting the day in this way is fantastic and gets the creative juices flowing. There are also so many beautiful places to sit and work. Something I love to do is to take photographs of the beautiful scenery. I then use them in my blog posts and social media. Whilst living in Spain I have invested in online courses and seminars, as I feel that it is important to be continually learning. Dealing with different time zones and internet hiccups have helped me to learn to look for ways around things rather than seeing them as reasons why we can’t do something. Something that has helped me a lot is being a part of Facebook groups where other like minded people hang out. You can share ideas and receive advice – it’s a win-win situation. And you can do this from anywhere in the world. I have also trained myself to focus on the present moment. I am actually taking the time to enjoy where I am and appreciate it. Even if it is just 10 minutes per day to start with, just sit on a bench somewhere and watch the world go by around you. Really allow yourself to switch off and immerse yourself in the moment. I have found this exercise to be extremely productive, rather like a form of meditation. My vision for the future is to help more and more people to be successful by creating a course for shy people to study in the comfort of their own homes. I am currently working on this, so watch this space! This entry was posted in Blog and tagged 52 Tips, Shy and successful, shy people, shy people can be successful too. Bookmark the permalink. My spouse and i still can not quite believe I could possibly be one of those studying the important reimdmenoatcons found on your site. My family and I are sincerely thankful on your generosity and for providing me the advantage to pursue my chosen career path. Thanks for the important information I managed to get from your web site.